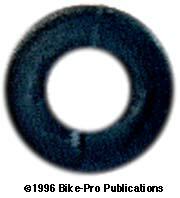 Inner tubes when inflated at modest to high pressure, will sometimes expand and balloon into the larger spoke hole in the rims cross-tie wall. If the drilling of the spoke holes has left a burr around the spoke hole, or if spoke itself is a little long after wheel truing there is the likelihood that these conditions will puncture the underside of the inner tube. Shortening an installed spoke is difficult, de-burring each hole maybe time consuming, so the industry has adopted the use of rimstrips. Rimstrips are made of flat cloth, fabric or rubber, joined at the ends to make a circular strip that fits tightly around the rim closing off the spoke holes. 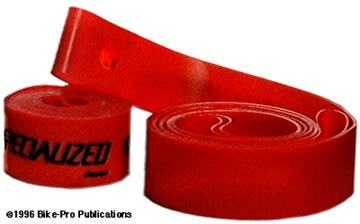 We sell the traditional rubber strips, made of a long thin rubber strip with a vulcanized seam joining the two ends. A Schrader valve diameter hole occurs in the area of the overlapping seam, reinforcing the hole with two layers of rubber. We sell them in two sizes, a 26" diameter, that covers the spoke hole area on any 26" rim, and a 700c/27" size that covers over the holes on a narrower road racing wheel. Specialized has made for them in Japan, Red plastic rimstrips. The 26" diameter size are 19.8mm wide and should on all 26" mountain rims. The 700c/27" diameter size are 10.5mm wide and should on all 700c/27" road rims. The plastic is un-yielding, with very little stretch. They have a hole for a Presta valve where the two plastic ends overlap and are joined. They will last the life of many wheel sets. The French maker of rimstrips, Velox has three models of cloth. The are made of White woven cotton fabric, so the sides of the strip won't unravel. The rim tape comes spooled on a plastic core, wound onto itself and adheres to the rim because of its self adhesive back. 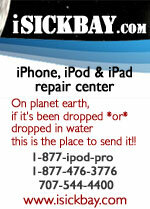 A hole to fit a Presta valve occurs about three inches from the beginning of the tape. Each roll of Velox will cover the spoke holes of one wheel up to 28" in diameter, you merely cut the tape to length after a small area of overlap. Each of the three models is use on different width rims, the #56 is 10mm or about 3/8" wide for use on narrow rims, the #51 is 17mm or about 5/8" wide, and the #220 is 22mm or about 7/8" wide for use on ATB rims. 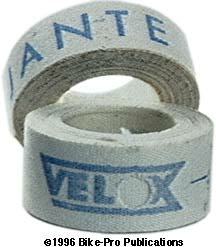 Jant tape is sold by the roll, with the specific weights of each roll listed below. As we mentioned in the overview, many rims come with Presta valve holes which are easily reamed out to the Schrader diameter, but what if you have a Schrader valve hole in your rim and want to use a Presta valved tube? This rubber grommet is pushed into the Schrader hole and has a lip on both sides to grip the top and bottom of the rim extrusion, narrowing the hole to the Presta diameter, giving the Presta valve support so the valve doesn't tear away form the inner tube. Made of Black rubber they weigh less than 1/2 a gram.